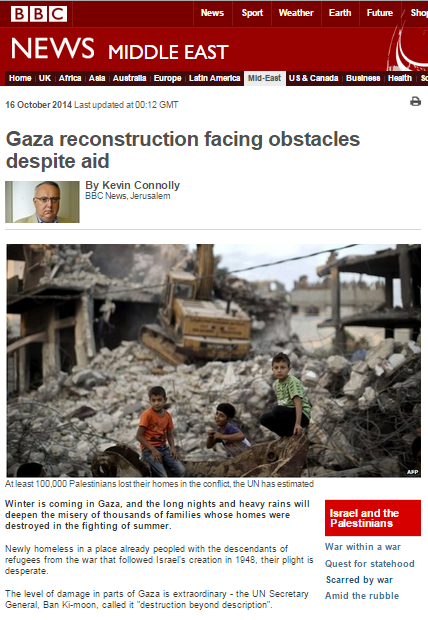 The flimsiness of the BBC Middle East editor’s adherence to editorial standards of accuracy and impartiality in his own Israel-related reporting is by now legend. It therefore came as little surprise to see that Jeremy Bowen applies a similarly politically motivated approach to the issue of the accuracy of content produced by other media outlets which he chooses to promote on social media. 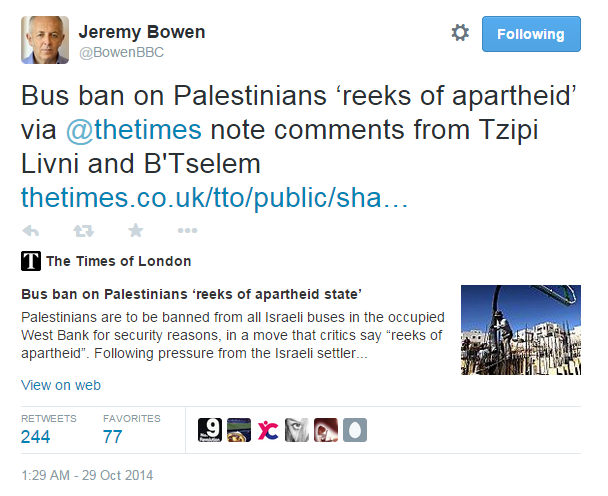 Bowen’s intentions are amply evident: he uses an article produced by the supposedly authoritative London Times to promote the notion of a ‘bus ban’ on Palestinians which purportedly shows that Israel is guilty of ‘apartheid’. The ‘apartheid’ trope – now a prime component in the toolbox of anti-Israel campaigners – is of course employed to portray Israel as a country beyond the pale, the existence of which no right-thinking person can tolerate just as the apartheid regime in South Africa could not be allowed to persist. However, the Times’ article was inaccurate, as our colleague Adam Levick at CiF Watch demonstrated. 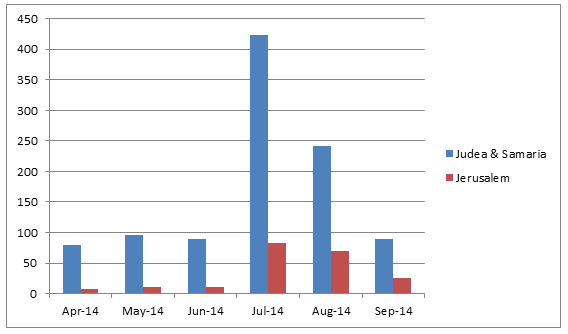 Moreover, the Times has since issued a correction to that article – a fact which Jeremy Bowen has to date failed to communicate to the 110 thousand people he misled. 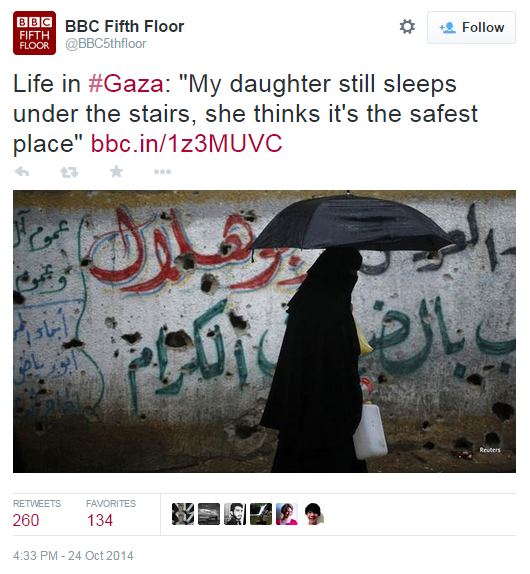 There is no way in which the intentional amplification of an inaccurate article promoting a defamatory slur well-known for its use by anti-Israel campaigners by the man responsible for the BBC’s Middle East content can be viewed as anything other than seriously compromising the BBC’s reputation for impartiality. Likewise, it is patently obvious that this Tweet from Bowen – along with many others – clearly communicates his “personal prejudices” to audiences. Will the BBC do anything about this latest blatant breach of its own editorial guidelines by a senior member of staff? We’re not holding our breath. “He was active in a push by Jews to pray at a sensitive Jerusalem holy site. 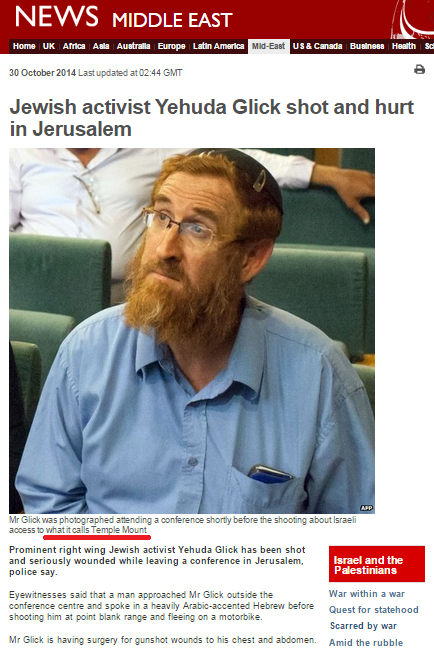 In other words, visitors to the BBC News website who read either of the first two versions of the article were not informed that Temple Mount (known as such not only by Israelis and long before the BBC’s obviously preferred title ‘Al-Aqsa compound’ came into existence) is the holiest site for Jews due to its being the location of the First and Second Temples. The failure to clarify that fact and the BBC’s use of the inaccurate phrase “Jewish claims to the Al-Aqsa Mosque compound” obviously misleads readers. Neither were audiences adequately informed why it is that non-Muslims (not just Jews) are currently not allowed to pray at the site or why, for example, a Christian wearing a crucifix would not be permitted to visit. “Yehuda Glick is a well-known campaigner for greater Jewish rights to pray at the site known to Jews as the Temple Mount, and to Muslims as Haram al-Sharif. Interestingly, a very similarly worded statement appeared in an AP report on October 18th. “The site is administered by an Islamic body called the Waqf, while Israeli police are in charge of security. 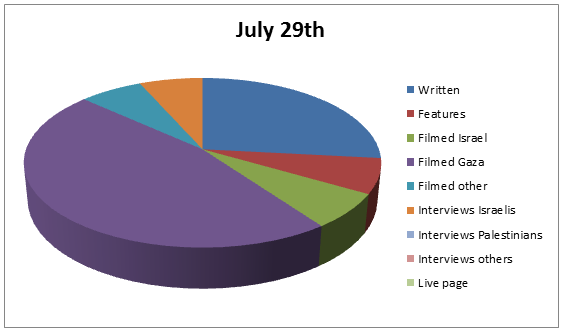 One might have thought that all BBC staff would be capable of writing about such a prominent issue accurately, thus avoiding the omission of such a crucial part of the story as the significance of Temple Mount in the Jewish religion and hence avoiding the situation whereby the accuracy of information received by a reader depends upon the time at which he or she accessed a BBC report. Obviously – as we have seen before – that is not the case. 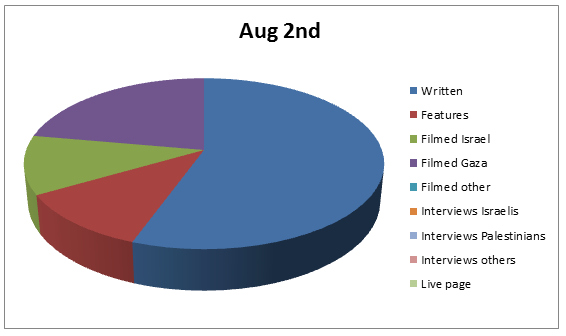 From the third version onwards the report was retitled “Jerusalem: Glick suspect killed in Israel police shoot-out“. 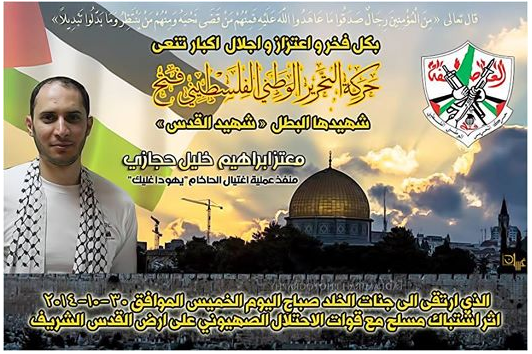 The appearance of several ‘martyrdom posters’ with the Fatah logo (Mahmoud Abbas’ party, of course) was likewise ignored, along with the Fatah statement “[w]e proudly mourn hero martyr. Shahid in Jerusalem son of Palestine. And the son of Fatah Moataz Ibrahim Hijazi”. 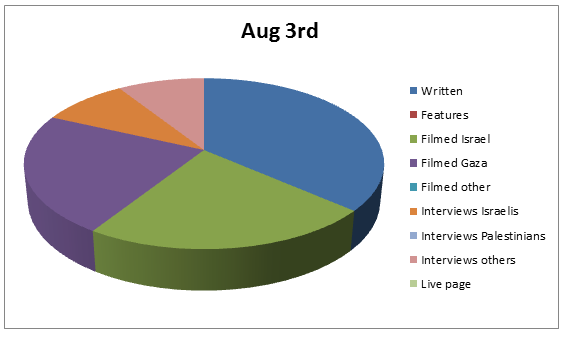 BBC audiences were also not informed in any of the versions of the report that Yehuda Glick had received numerous threats in the past. “A spokesman for Palestinian leader Mahmoud Abbas has described the closure of a disputed Jerusalem holy site as a “declaration of war”. Palestinians hold the Israeli government responsible for a “dangerous act”, Mr Abbas was quoted as saying by Mr Rudeina, in remarks carried by AFP news agency. However, no attempt was made in either this version or any other of the report’s various incarnations to place its subject matter – and the PA president’s latest propaganda – in the context of recent incitement from the highest levels of the Palestinian Authority. As PMW has reported, a video of part of a speech made by Abbas on October 17th was broadcast nineteen times in three days by official PA television. The day after that speech Abbas made another to the Fatah Revolutionary Council in which he dehumanized Jews visiting Temple Mount by referring to them as a “herd of cattle” and accusing them of “desecrating our holy sites”. On October 27th the prime minister of the Palestinian Unity Government Rami Hamdallah visited Temple Mount, using the opportunity to accuse Jews of “Judaizing” Jerusalem. Hamdallah accused Israel of working toward Judaizing Jerusalem and the Aksa Mosque. With the PA’s employment of the issue of Temple Mount being used to escalate its incitement to new heights, it is obviously essential that BBC audiences be made aware of the highly significant contribution of that factor to the current violence if they are to fully comprehend current and future events. This article, however, makes no attempt to meet the BBC’s obligation to build “understanding” of the issue. 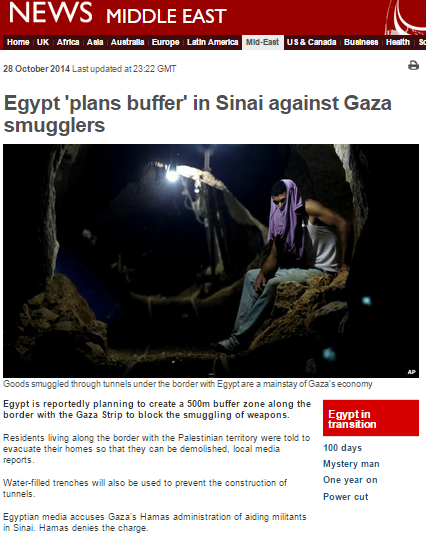 On October 28th an article appeared on the BBC News website’s Middle East page under the title “Egypt ‘plans buffer’ in Sinai against Gaza smugglers“. 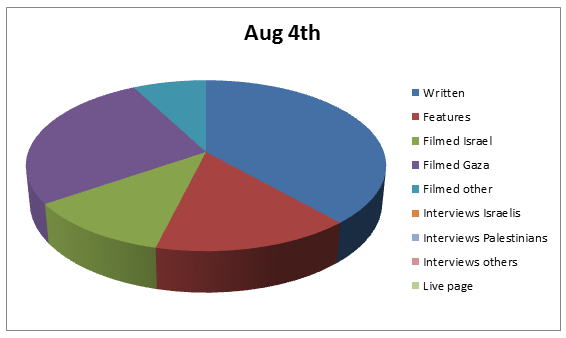 The report appears to be based at least in part on an Associated Press article of the same date. “Egyptian media meanwhile has accused Gaza’s Hamas rulers for meddling in Egypt’s affairs, with some suggesting that the Islamic militant group is supporting fighters inside Egypt since the military overthrew Egypt’s elected President, the Islamist Mohammed Morsi, last year. However, as noted here in a previous post, the accusations did not come from “Egyptian media”, but from a senior Egyptian official speaking to Asharq Al-Awsat. “Maj. Gen. Sameeh Beshadi, who was formerly in charge of security in the North Sinai governorate where the attacks took place, said there was “no doubt that Palestinian elements had taken part in the attacks,” which killed at least 30 soldiers, according to security and medical officials. 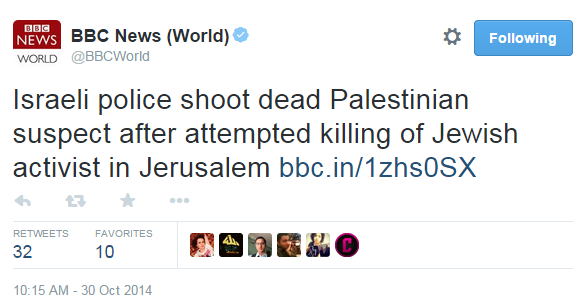 Clearly that AP claim was not properly fact-checked before it was recycled by the BBC. In fact, as has been noted here on previous occasions, the construction of smuggling tunnels along the border between the Gaza Strip and Egypt began in 1994 – long before the introduction of border restrictions by Israel in response to Hamas terrorism. From the very beginning those tunnels were used to smuggle weapons and terror operatives into the Gaza Strip in addition to drugs and contraband: hence, rather than being a product of the partial blockade, they are actually one of its causes. Obviously, without accurate presentation of the issues of the smuggling tunnels and their role in Palestinian involvement in the terrorism prevalent in northern Sinai (a topic the BBC has scrupulously avoided to date), BBC audiences will be incapable of reaching a proper understanding of Egypt’s policies. Where exactly is the mysterious place “between Gaza and parts of Israel” in which “rockets and mortars were raining down” is unclear, but presenter David Amanor uses the same peculiar phrase in his introduction. The conversation between Amanor and Alkashif continues in much the same vein until the end of the item and – notably – the word Hamas still does not appear once. Alkashif’s decidedly debatable claim that the BBC provides information “without emotions” is of course all the more jarring due to its appearance in an item which is all about manipulating the emotions of its listeners. The entire item presents audiences with a subjective and inaccurate picture of a war waged by Israel on the civilian population of Gaza with the accent on children: Alkashif’s own children, the children on the beach, the dead children he saw in Shuja’iya. No attempt is made whatsoever to place Alkashif’s experiences in context: there are no terrorists in his war, the population of the Gaza Strip is entirely passive, Shuja’iya is just a residential neighbourhood rather than the site of Hamas assets and installations, buildings are just “bombed” for no apparent reason. Two months after the ceasefire which brought the war to an end, it is blatantly obvious that the manipulation of public opinion by means of selective presentation of the conflict remains a priority for the BBC. 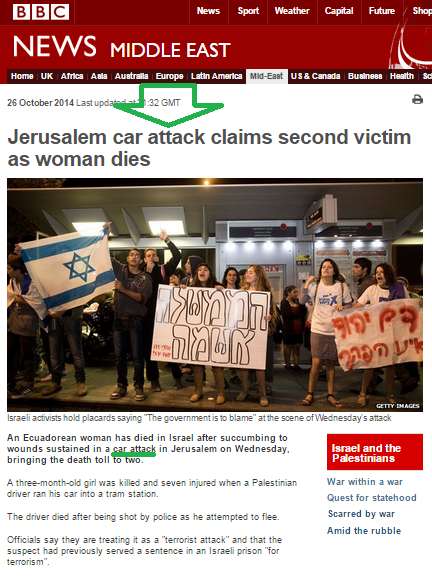 Both the headline and the text of the original version of the BBC News website’s October 26th report on the death of a second victim of last week’s terror attack in Jerusalem continued the corporation’s earlier bizarre presentation of the incident as a “car attack”. 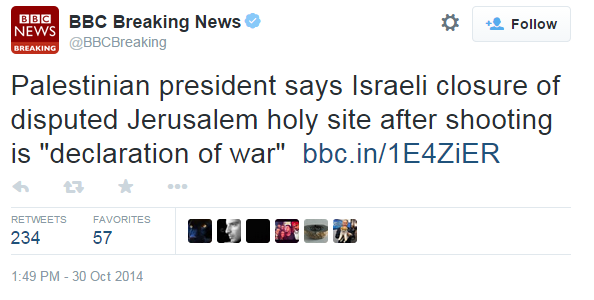 Likewise, the article continued to use the word terror exclusively in the context of quotes from Israeli officials. “A three-month-old girl was killed and seven injured when a Palestinian driver ran his car into a tram station. Some fourteen hours after the article’s initial publication it was amended but the headline still describes the incident as a “car attack”, the terrorist is described both as an “attacker” and a “driver” and the one reference to terror is still in quotation marks. “An Ecuadorean woman who was injured in a Palestinian attack in Jerusalem on Wednesday in which a three-month-old baby girl was also killed has died. They were among a group of people hit when the attacker ran his car into pedestrians at a tram station. Relating to a separate incident, both versions of the article inaccurately describe Orwah Hammad as having been shot by “Israeli police” – rather than an army unit as was actually the case. “East Jerusalem has experienced months of unrest since a Palestinian teenager was abducted and burned to death in early July, two days after the discovery of the bodies of three Israeli teenagers who were abducted and killed in the occupied West Bank in mid-June. 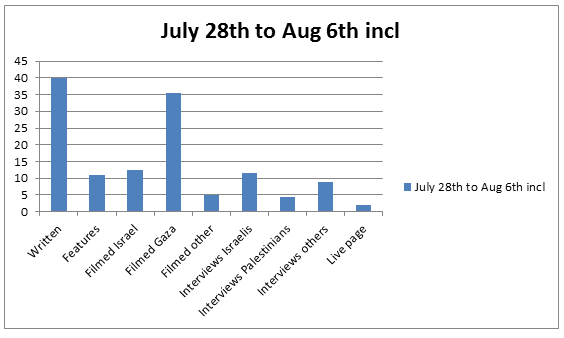 Rioting and attacks by Palestinians since June 12th have not been confined to “East Jerusalem” and have in fact been more prevalent in Judea & Samaria. Notably, no attempt is made to clarify to readers that the kidnapping and murders of the three Israeli teenagers was carried out by a Hamas cell in Hebron with funding from the Gaza Strip. 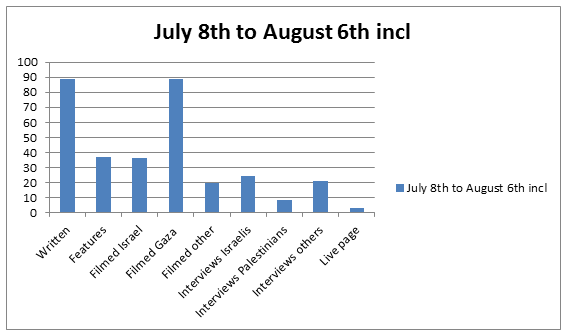 As we have seen before, the BBC is intent upon promoting the myth of a “cycle of violence” and the erroneous notion that the summer conflict between Israel and Hamas was caused by the four murders. In order to do so, it erases from audience view the hundreds of missiles launched at civilian targets in Israel between June 12th and the commencement of Operation Protective Edge on July 8th. It was of course that intense missile fire which was the reason for the military operation, with the later discovery of dozens of cross-border tunnels prompting the subsequent ground operation. The military operation could have been avoided had Hamas elected to take advantage of the ample opportunities it was given to stop the missile fire before July 8th, but the terrorist organisation chose not to do so – for reasons not by any means exclusively connected to Israel. 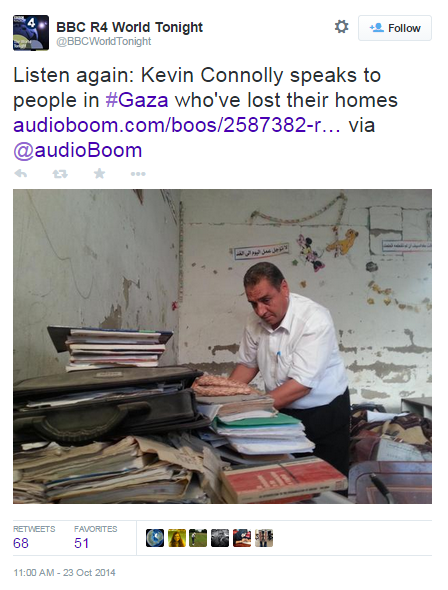 It is high time that the BBC ceased to promote this inaccurate version of events in which Hamas’ instigation of the hostilities is concealed from audiences. 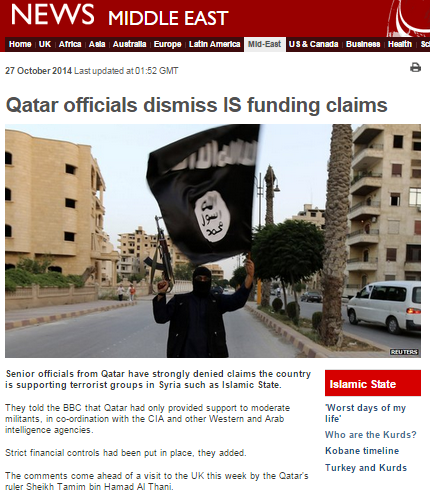 BBC playing wingman for Qatar’s damage control in the UK? 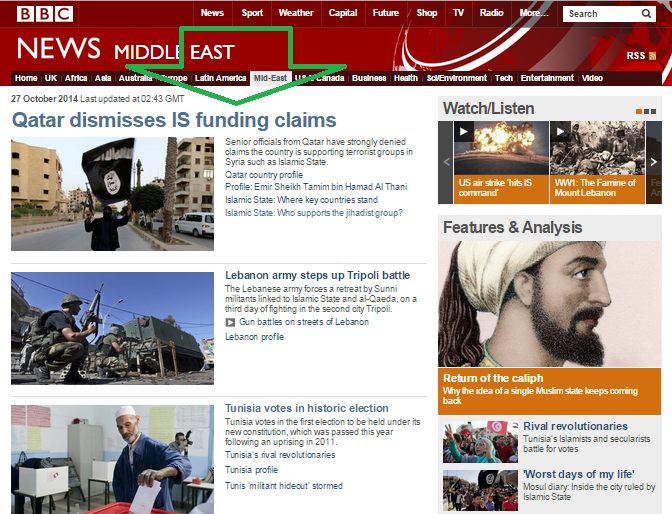 The lead article on the BBC News website’s Middle East page on October 27th (also appearing on the site’s main homepage) was headlined “Qatar officials dismiss IS funding claims“. Coincidentally or not, the report appeared just hours before the Emir of Qatar is due to arrive in the UK for a three-day official visit aimed at “enhancing bi-lateral relations” between the two countries. “Senior officials from Qatar have strongly denied claims the country is supporting terrorist groups in Syria such as Islamic State. They told the BBC that Qatar had only provided support to moderate militants, in co-ordination with the CIA and other Western and Arab intelligence agencies. So that’s alright then. Or maybe not…. “In the past, wealthy individuals in the emirate are believed to have made donations and the government gave money and weapons to hardline Islamist groups in Syria. Doha is also believed to have links to the al-Nusra Front, an al-Qaeda affiliate. But officials, including Qatar’s director of Intelligence, told the BBC the country had nothing to hide over its support for groups in Syria fighting President Assad’s regime. The BBC’s Frank Gardner said the officials conceded that there had been constant shifts in allegiances in Syria’s civil war and some people previously considered moderate had later joined hard line Islamist militias. So is the BBC trying to tell us that the Al Qaeda-linked Al Nusra Front with its known (not “believed” as the BBC claims) links to Qatar should be viewed as one of the groups of “moderate militants” which Qatar says it supports rather than as a terrorist organisation? Notably Frank Gardner did not find it necessary to inform readers that the UN, US, UK, Australia and Turkey have all designated the Al Nusra Front. Clearly readers of this report are being herded towards the belief that lax Qatari regulation which gives a green light to terror financing is now a thing of the past. However, the US obviously does not believe that is the case, as the WSJ reported just four days before the publication of this BBC report. “An al-Qaeda financier jailed for his role in funding the mastermind behind 9/11 is once again raising money for Islamist terrorists after being freed by the Qatari authorities, The Telegraph can disclose. Of course the very pertinent issue of Qatar’s financing of radical Islamists in the Middle East is by no means limited to Syria and Iraq or to the activities of individuals. And as readers are no doubt aware, Hamas (designated by the US and the EU, among others) is also on the list of Qatari protégés, with Fatah apparently also now angling for Qatari cash. Whilst Qatari officials may well be delighted by this latest BBC-supplied opportunity to amplify their denials of funding of the West’s current bête noire – ISIS – the emirate’s policy driven approach to the funding of Islamist extremists should be seen in the context of a statement made by the country’s Emir during an interview with CNN last month. Qatar’s selective and opportunistic approach to defining terrorism – and hence what constitutes terror financing – should of course also be viewed in the context of its financial relations with the West. “… it is vital to remember Qatar’s role as a provider of natural gas to Europe, and its investments in both Europe and the U.S. Qatar sits on 26 trillion cubic meters of natural gas—the world’s third largest reserve. It has a sovereign wealth fund of $85 billion. And European countries are currently seeking private investment as they emerge out of austerity into growth. It seems that the self-styled “standard-setter for international journalism” is quite happy to go along with Qatar’s attempts at damage control intended to mitigate the growing political pressure on the Emir’s British hosts by failing to fully inform BBC audiences on the topic of Qatari funding of Hamas, Jabhat al Nusra and other terrorist organisations or the activities of individuals with links to the Qatari regime. “Egyptian President Abdul Fattah al-Sisi says the country is facing a threat to its existence from jihadists after the military suffered the biggest loss of life in decades in attacks in Sinai. At least 31 soldiers were killed in two attacks on Friday, the deadliest a bomb blast near the town of El-Arish. A three-month state of emergency has been declared in parts of the Sinai Peninsula and Egypt’s Rafah crossing into the Gaza Strip was closed. 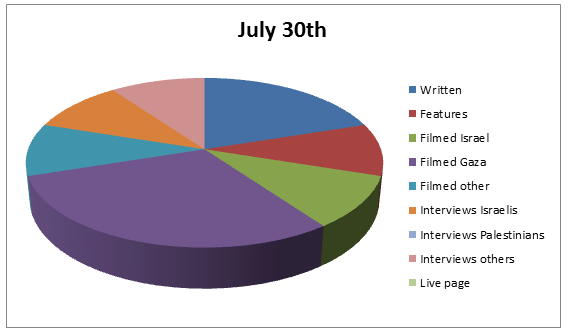 There will be three days of mourning. 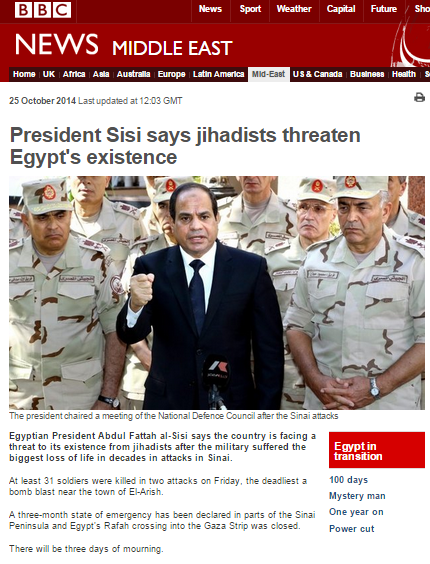 In a live TV address, Mr Sisi said a huge plot was being waged against Egypt “by external forces”. Can we imagine a similar tone being adopted in BBC coverage if Israel decided to close the Erez or Kerem Shalom crossings indefinitely? 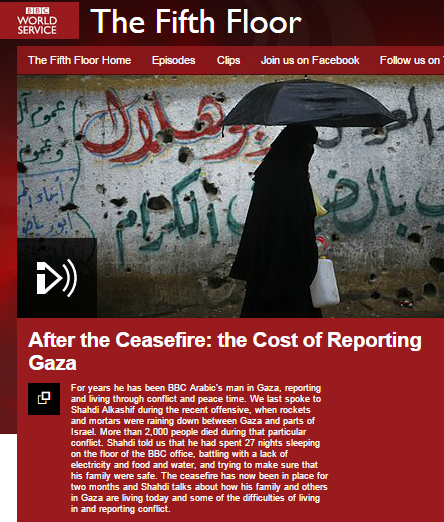 This is precisely the sort of background information which has been consistently omitted from BBC portrayals of the border restrictions imposed by Egypt and Israel on the Gaza Strip both before the recent conflict and especially since July of this year when the corporation self-conscripted to context-free and inaccurate promotion of Hamas’ demands to lift those restrictions.